Biogen (BIIB - Get Report) stock was under significant pressure on Thursday, collapsing 29.2% after the company announced the termination of two late-stage studies for a treatment of Alzheimer's. The news is a devastating blow to the bulls, who just yesterday were in a stock bubbling just below multi-year highs. On Thursday, they woke up to find Biogen stock sitting at 30-month lows. Ouch. So is now the time to step away from Biogen or do we buy the dip in this biotech giant? 4-year weekly chart of Biogen stock. To get an idea about the size of this decline, we had to zoom out and use a four-year weekly chart of Biogen stock. This shows the magnitude of Thursday's decline, with Biogen slashing through its 10-week, 50-week and 200-week moving averages all at once. It also broke below channel support, after a continual stall at channel resistance (blue lines). With a decline of more than 20% -- and really, pushing 30% -- it's a given that a decline like this would deal a blow to the technicals. A decline of this size would do that to just about any stock's chart. 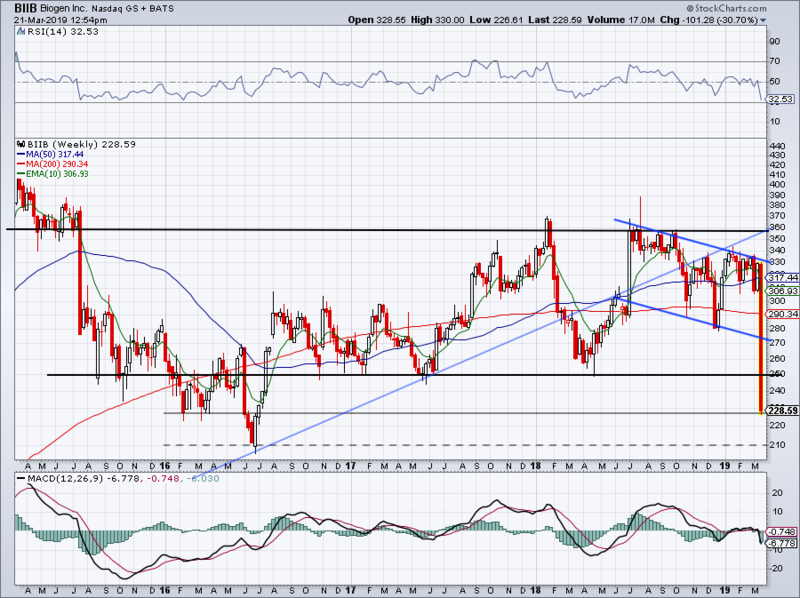 However, the worry here is Biogen stock's inability to stay above $250. This level has played a support role for four years, with it only really failing in 2016. The problem? Who wants to rush in and buy Biogen stock down almost one-third overnight as it clings to this level of support? Not me. At a minimum, I need to see another two to three sessions, and preferably see how it closes next week. Should this level hold and Biogen stock makes its way higher over the next few weeks or months, watch $250. If this level acts as resistance, BIIB could be in trouble longer term. The bottom line? I'm not buying the dip in Biogen.